Definition at line 22 of file CNormalItem.h. Enumeration of possible item types. Definition at line 28 of file CNormalItem.h. Definition at line 33 of file CNormalItem.cpp. Definition at line 39 of file CNormalItem.cpp. Definition at line 45 of file CNormalItem.cpp. Definition at line 127 of file CNormalItem.cpp. Retrieve the name of this item. Definition at line 82 of file CNormalItem.cpp. 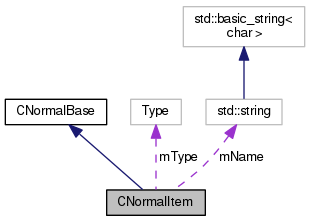 Referenced by CNormalChoice::checkConditionTree(), CNormalChoiceLogical::checkConditionTree(), contains_necessary_mass_action_elements(), convertToCEvaluationNode(), and normalize_variable_names(). Retrieve the type of this item. Definition at line 91 of file CNormalItem.cpp. Examine inequality of two item. Definition at line 107 of file CNormalItem.cpp. Definition at line 51 of file CNormalItem.cpp. Examine equality of two items. Definition at line 100 of file CNormalItem.cpp. Definition at line 62 of file CNormalItem.cpp. Referenced by normalize_variable_names(), and test_simplify::test_simplify_1(). Set the type of this item. Definition at line 72 of file CNormalItem.cpp. Definition at line 97 of file CNormalItem.h. Definition at line 116 of file CNormalItem.cpp. Definition at line 121 of file CNormalItem.cpp. Definition at line 34 of file CNormalItem.h. Referenced by getName(), operator<(), operator=(), operator==(), setName(), and toString(). Definition at line 35 of file CNormalItem.h. Referenced by getType(), operator<(), operator=(), operator==(), and setType().